There is a variety of methods for making hard-cooked eggs. Some swear they have good luck with one way over another. You will have to experiment to see which works best for you. Other things to consider is how you are going to use the egg–dyeing them, for deviled eggs, chopped for salads, etc. For egg dyeing, you would want a method that minimizes the chances for cracking the eggs. With deviled eggs, you are wanting a process that makes peeling easy. Alton Brown, ‘I am Just Here for the Food‘ made this method popular. Place eggs in a muffin tin or on the rack itself with a cookie sheet place below to catch drippings from any eggs that may break. Transfer eggs to a bowl with ice water for about 10 minutes. Peel and return eggs to ice water to finish cooling. This method may create browning of the egg both inside and outside. You may have to experiment with oven temps and time until satisfied with the outcome. See instructions here. If you are not dyeing the eggs, roll the eggs around in the pan after draining to crack them before adding to the cold water for easier peeling. You can add one tablespoon vinegar to the water when cooking if you are not dyeing them. 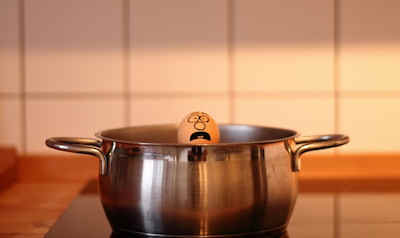 Some claim hot water boiling make eggs easier to peel. Pour water into a pan, place on a burner and set to medium-high. There should be enough water to cover the eggs by two inches. When the water reaches a rolling boil, add your eggs carefully to the water using a spoon or tong to lower the eggs into the pot. Add one tablespoon vinegar. Do not use the vinegar if you are dyeing the eggs as it will pit them. According to Mathew Jedeikin , adding vinegar was the one thing that noticeably made eggs easier to peel. When the water returns to a rolling boil, count 30 seconds then turn the burner to simmer. Drain the eggs and roll the eggs around the pan cracking them–if you are not dyeing them. Place eggs in an ice water bath until you can comfortably handle them. Peel the eggs and return to the bath to finish cooling them, usually around twenty minutes. There is a couple of factors that may affect the timing of your eggs–the settings on your stove and the conductivity of your pot. It may take some experimenting to get the time right. I recommend using a heat sensitive egg timer. Put the timer in the pan when adding the eggs and it will indicate when the eggs are cooked. Another option is to use an electric kettle. Purchase the type that shuts off once the pot starts boiling. Place your eggs in the kettle. Add water to cover the eggs and turn on your kettle. When the pot turns itself off, set the timer for 10 to 15 minutes. Follow instructions above after heading ‘when the eggs are cooked‘. Place a steamer basket in the pot. Add eggs and cover with lid. Bring water to a boil then reduce to a simmer. Cook for about fifteen minutes. A rice cooker is basically an electric steamer. Place a steamer basket in your cooker. Add water, so it reaches the basket. Add eggs and cover with the lid. Set timer for twenty minutes–times may vary with individual rice cookers. Place eggs in the bottom of the pot. Cover the eggs with water. Set the steam for 10 minutes–times may vary. When done, move the eggs to ice water using a tong. Place Instant Pot egg rack in the bottom of the pot. Place eggs on the rack and add one cup of water. Use the manual setting high. Set the timer for five minutes. It will take the pot about 5 minutes to reach pressure and then it will cook for five minutes. Times may vary depending on the pressure cooker. When the unit buzzes, turn it off and set a timer for four minutes. After four minutes, perform a quick release of pressure. Remove eggs with a tong to a bowl of ice water. Wait…what? If you are making eggs to chop into salads, a microwave is a quick and easy way to cook them. The key is not to cook them at full power. The whites cook faster than the yolk and can cause the yolk to explode, or you end up with overcooked whites. Oil your microwave safe cup. Carefully break an egg into a cup. The timing depends on the power of your microwave. According to this Reddit author his 1500 watt microwave took 2 minutes and 45 seconds. Check the egg frequently until you know how long it will take in your microwave. If you hear hissing, stop the oven and pierce the egg with a toothpick to release the steam. You will not get a perfect looking hard-cooked egg, but if you are chopping them up for a salad–you don’t need one. Another use for the microwave is when you discover your hard-cooked eggs are not done. 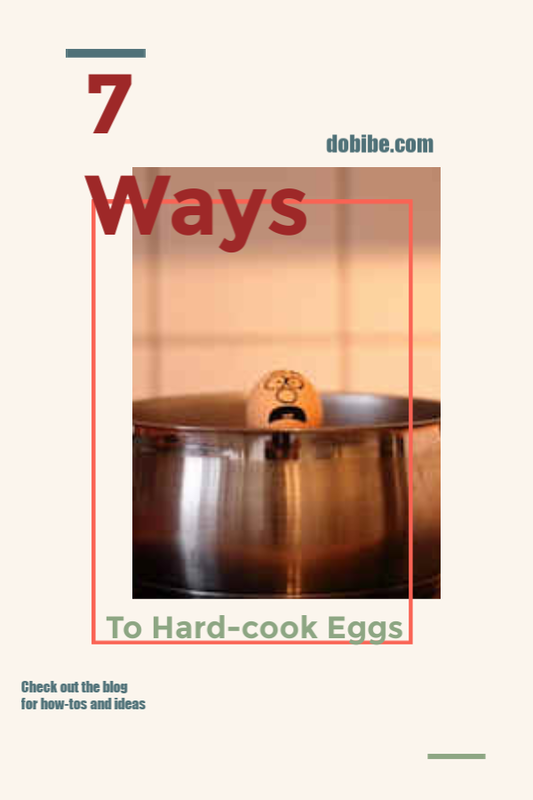 According to the ‘The New Food Lover’s Tiptionary,’ pierce the egg with a fork then microwave at 50% for twenty seconds, then let set for another twenty seconds before testing for doneness. An egg slicer is my favorite tool for doing quick work at chopping eggs. I slice then hold the egg together as I position for a crosscut. Eggs are easier to slice if they are cold. As you can see hard cooking eggs is not an exact science. You will have to experiment with your equipment to get the right timing. Please share with us your method of hard cooking eggs below in the comments. Thank you so much for reading, if you enjoyed this blog post please give it a share.